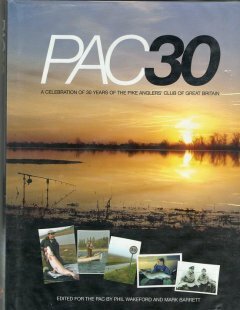 In 2007 the Pike Anglers Club of Great Britain celebrated its thirtieth anniversary. The incumbent committee chose to commemorate this historic landmark with a book. Not just any book; a compilation of thirty pike fishing tales from some of the most prominent anglers in the club’s history. Pike anglers for years to come will thank them for their efforts as they read and reread wonderful stories of piking triumph and heartache. From the Norfolk Broads to the Irish Loughs; from the Cambridgeshire Fens to the Glacial lakes of Cumbria and Scotland; from Gravel Pits and Trout Reservoirs, Rivers and Drains; this book captures all of the significant waters, and many of the captures, that have shaped piking history. Barrie Rickards leads the reader into the book with some tales from his piking diaries, starting in East Yorkshire in the 1950’s and finishing with his 202nd twenty pound pike, which Barrie caught in 1999. The Norfolk Broads have long been associated with massive pike and anglers such as Derrick Amies and John Watson, the latter revealing his broads records. Former british pike record holder Derrick Amies was lucky enough to spend his formative years honing his own skills in the company of another Broads’ legend, Dennis Pye. Derrick reveals some of the secrets that helped Dennis to bank pike to over thirty pounds. The story of how Llandegfedd Reservoir came to open for pike fishing, sparking a golden era in big pike fishing and culminating in the current British record, is penned by Pete Climo who was rewarded with his own forty. A weekend in Wales is Steve Gould’s account of the capture of the future record fish when it weighed 29 pounds. Current british record holder Roy Lewis’ ‘My record pike’ is a story that every other pike angler can only dream of emulating. There is something special about the capture of a pike from huge natural waters such as the glacial lakes in Cumbria and Scotland, the Irish Loughs or a large river like the Wye. The reader is treated to several tales; A Wonderful Life is Chris Donovan’s story of the highs of catching Irish thirties and the lows of Gill netting. Scott Davidson and Jon Neafcy share personal achievements on Scottish Lochs and Cumbrian Lakes respectively. ‘The Lydia Fish’ follows Steve Bown’s pursuit of a wild, River Wye thirty. My own pike fishing centres on the flat landscape of South Yorkshire and North Lincolnshire and, in particular, the drains and rivers. Perhaps this is the reason why I like to read about the Fens. Knowing that the pike could be 100 yards or a mile in either direction holds a strange attraction that I can’t begin to explain. I felt inspired to stretch my own boundaries by Denis Moules’ wonderful tales of the River Lark in ‘A fenland river returns to life’. PAC30 is at times gentle, nostalgic and mournful, then again joyous, thrilling and inspiring. As a record of the story of pike fishing it captures a small period in time, but encapsulates a very rich history in pike angling. There are many more stories, but a particular mention should go to Mark Barrett and Phil Wakeford as editors and the rest of the P.A.C. committee for putting in the effort to bring this project to fruition in a short space of time. The next thirty years will reveal its legendary waters and successful anglers. If our future is as rich as our past we should hope only for two things. Firstly, to be fortunate enough to play a small part in it, and secondly, that the Pike Anglers Club committee of the time show the same endeavour as their predecessors and record those special moments for the next generation to read about.